Astasia Kennels breeders of a Gold medal winner, 3 Silver medal winners, 1 Australian Sieger, 3 State Siegers, 6 State Siegerins, National, Main Breed and State Breeders Groups. Astasia Kennels are also breeders of "Dual Champion" and "Dual Trophy" winners. Astasia Kennels are also breeders of over 100 Breed Surveyed Dogs and 18 Australian Champions. 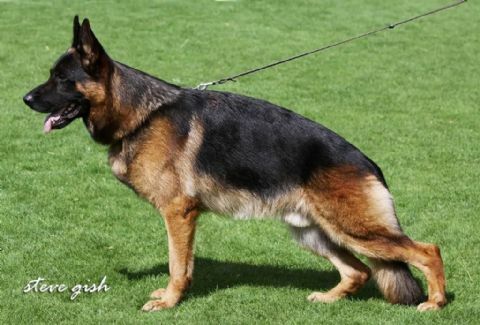 Astasia Kennels have imported the following 'Excellent Select' German Shepherd Dogs. NATIONALS, MAIN BREED EVALUATIONS AND STATE BREED EVALUATIONS. *Alk von Domenica Kkl. Ia Normal Sch. HIII H-neg Imp. Ger. 4th Open Dog GSD National, Reserve Sieger AUS, State Sieger QLD. Ch. *Xaro von der Plassenburg Kkl. Ia Normal ED Normal IPO2 H-neg Imp. Ger. 4th Open Dog GSD National 2015, 3rd Open Dog GSD National 2016 (Bronze medal ) State Sieger QLD, 4th Open Dog GSD National 2017. *Awesamshep Brandy AZ 9th Open GSD National 2016. *Astasia Roxi A Z Ex. Merit 2016.